Summary: A musical adaptation of Tolstoy's novel War and Peace that is neither about war nor peace, but rather focuses on the love triangle between Andrey, Natasha, and Anatole, told in an immersive style. Highlights: It takes some chutzpah to take Tolstoy's epic novel (or even one section of it) and turn it into a wild and crazy modern opera. But that's what Dave Malloy did, writing the book, lyrics (many of which are pulled directly from the novel), music (in a style that mixes Russian folk with modern pop and rock music), and orchestration, and even playing the role of Pierre in early productions. He and director Rachel Chavkin (who recently directed The Royal Family at the Guthrie) have created this totally unique immersive style. The Imperial Theatre has been turned into a theater-in-the-round with some 20o seats on stage with cabaret tables and banquette seating (where I was able to snag some half-price day-of seats at tkts). 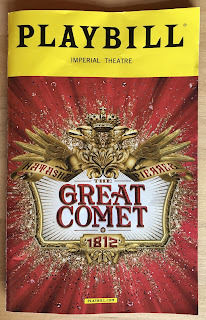 The huge cast (some 30 people) wanders among the onstage audience as well as into the house, where platforms and walkways have been built, interacting with and engaging the crowd. You might be given a pierogi, an egg shaker, or vodka (if you're lucky), or be asked to deliver a letter, or be serenaded to. 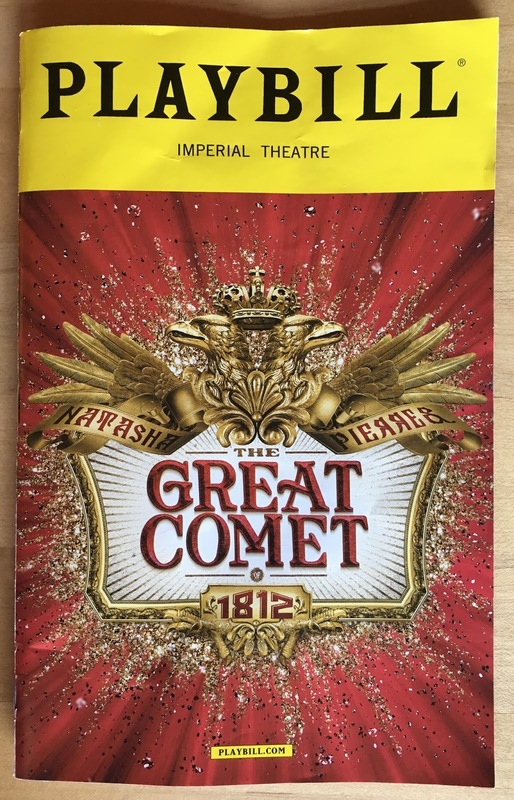 It's quite thrilling to hear the music coming from all sides of you and feel like you're in the middle of the story, and combined with the lighting effects (hundreds of light bulbs hanging from the ceiling and great comet chandeliers), it's a beautiful effect. Oh yeah, the story. The reason to see the show is the spectacle of it, and the energetic performances of the entire ensemble who play instruments, sing, and dance in their modern/period mixed wardrobe. The story is a fairly cliche love triangle. Natasha (an appealing Denee Benton) loves Andrey (Nicholas Belton) until he goes off to war, when she falls in love with Anatole (understudy Blaine Alden Krauss, who was so magnetic most of the audience fell in love with him too). And then after her "disgrace," Pierre (Josh Groban, who's lovely but not the star of the show) also falls in love with her. Basically, Natasha is like Steffy on The Bold and the Beautiful - I can't tell which man she loves, she seems to love whoever is in front of her, so I can't get invested in the outcome of the triangle. But it's a fun and wild ride unlike any other Broadway experience.